Parthasarathy Ganesh is a quiet, unassuming young man. This scion of the Gottuvadyam Narayana Iyengar tradition is one of today's leading exponents of the Chitravina, following in the footsteps of his gurus - uncle Chitravina Narasimhan and famous elder cousin Chitravina Ravikiran. Paired with his other cousin K. N. Shashikiran as the "Carnatica Brothers", Ganesh has also made a mark in the vocal music circuit. He is also a valuable member of the Carnatica family, being a leading and sought-after teacher in our gurukulams. Ganesh has all along been known among his friends, family and well-wishers as a man of quiet dedication to the art of music. The steely will and discipline lurking beneath his soft-spoken demeanour was on full display over the last two days at Carnatica's main gurukulam in T. Nagar, Chennai. 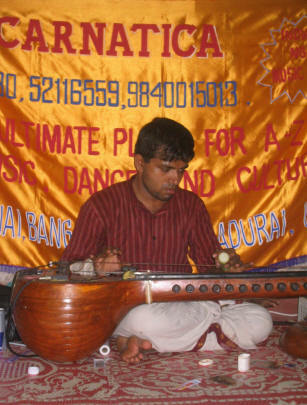 Taking up the challenge of playing a marathon continuous instrumental performance, Ganesh bravely battled waves of pain, fatigue, sleep and hunger to notch up a record-breaking 33+ hours of non-stop music. Starting at 4 pm on Thursday, May 27th Ganesh played on until 1.15 am on Saturday May 29th, taking only a SINGLE five-minute break somewhere in the middle. Covering a gamut of composers and ragams, he rendered over 120 kritis. Cheered on by friends, family and Carnatica members and supported by a whole bunch of young accompanists, Ganesh's stated objectives were prayers for world peace and the benediction of the rain gods for water-starved Chennai. But it is just not in his nature to talk at great length about these things... when he was asked by the reporter from NDTV why he was doing this, he briefly looked up from his vadyam, gave one of his trademark shy smiles and said "Just like that" and continued playing, paying scant attention to the bustle and hoopla around him! He dedicated the effort to the memory of his late mother and his gurus. Carnatica is proud of you, Ganesh! We wish you continued success and greater glory.